Develop a weed management program. Monitor inside and outside of greenhouses, potting and propagation areas, holding areas, and areas adjacent to these locations for the presence of weeds on a regular basis. When scouting, identify the type of weeds (broadleaf, or grass), life cycle (annual, biennial or perennial) and location. It is critical to remove weeds from greenhouse pots, benches and floors before they flower and produce seed. Keep weed seeds, and rhizomes out of the greenhouse by using sterile media," clean " plant materials, and controlling weeds outside the greenhouse. Prevent weeds from going to seed in all areas of the greenhouse. Control measures include mowing outdoors, hand-pulling, and selected herbicides. Optimize the production cycle and minimize the duration in which perennials remain. Maintain weed-free areas around and between greenhouses and hoophouses. Use a physical barrier such as a weed block fabric helps to limit weed establishment on greenhouse floors. Leave the weed fabric bare so it can be easily swept and repair tears as they appear. Clean container media that has spilled or has fallen and all plant debris from container area. Use growing media that is weed-free. Use liners and transplants that are weed-free. Routinely monitor newly potted plants. Newly planted containers can be very prone to weed growth. Thoroughly wash containers that are going to be reused. Washing should be done in a manner that removes all leftover growing media and weed seeds. Use container surface covers or weed-mulch materials as container surface covers for perennials. To control existing weeds: 1) hand pull or 2) using a postemergence herbicide. These measures do not prevent reseeding of weeds. Consider all characteristics of a particular herbicide when selecting an herbicide. Always be sure the herbicide selected is labeled for use in the greenhouse. Carefully follow all label instructions and precautions. It is the applicator’s responsibility to read and follow all label directions. Read and understand the product labels of all herbicide products before application. Use a dedicated sprayer that is clearly labeled for herbicide use only. Keep accurate records of all herbicide applications on file. Clean herbicide application equipment after application. When applying herbicides outside of the greenhouse, close the greenhouse vents and openings during herbicide applications to prevent drift inside to sensitive crops. Maintaining weed-free growing conditions is necessary to produce high quality greenhouse crops while reducing pesticide use. Insects and diseases can be kept to a minimum only if proper weed control practices are carried out regularly, along with appropriate control measures. Weeds may compete with desirable crop plants for light, water and nutrients. Weeds are also a primary source of insects such as aphids, whiteflies, thrips, and other pests such as mites, slugs and diseases. Many common greenhouse weeds such as chickweed, oxalis, bittercress, jewelweed, dandelion and ground ivy can become infected with tospoviruses including impatiens necrotic spot virus (INSV) and tomato spotted wilt virus (TSWV) while showing few, if any visible symptoms. Thrips can then vector the virus to susceptible greenhouse crops. Weeds can also carry other plant damaging viruses that are vectored by aphids. An integrated weed management program will help to effectively manage weed populations. This approach includes preventive measures, sanitation, physical barriers, handweeding and the selective use of postemergence herbicides. Weed seeds are easily blown into the greenhouse through vents and other openings. Weeds and their seeds can be brought into the greenhouse on infected plant material, tools, and equipment. Seeds can be moved in soil, by the wind, irrigation water, animals and people. Creeping wood sorrel, (Oxalis corniculata), hairy bitter cress (Cardamine hirsuta), prostrate spurge (Euphorbia humistrata), common chickweed (Stellaria media) and other weeds are persistent problems in greenhouses. These annual weeds reproduce primarily by seed, with several generations occurring per year. Prevention and sanitation are the grower’s first line of defense. Keep weed seeds, and rhizomes out of the greenhouse by using sterile media," clean " plant materials, and controlling weeds outside the greenhouse. Screening vents and other openings will help to limit the entry of wind blown seed, as well as insects. When scouting, identify the type of weeds (broadleaf, or grass), life cycle (annual, biennial or perennial) and location. It is critical to remove weeds from greenhouse pots, benches and floors before they flower and produce seed. For example, a single plant of bittercress can produce 5000 seeds, that germinate in as little as 5 days and can propel the seeds over 9 feet from the plant. 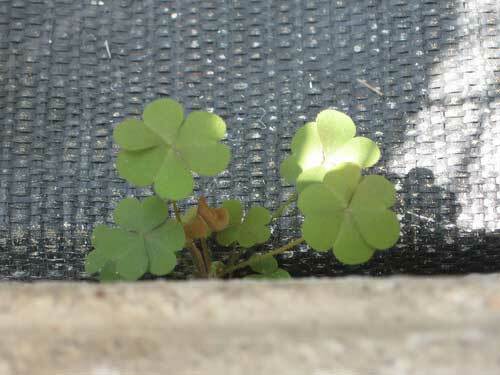 Yellow woodsorrel and creeping woodsorrel also expel seeds by force throughout a greenhouse. The use of a physical barrier such as a weed block fabric helps to limit weed establishment on greenhouse floors. Leave the weed fabric bare so it can be easily swept. Covering the weed fabric with gravel makes it difficult to remove any spilled potting media providing an ideal environment for weed growth. Regularly handpull any escaped weeds before they go to seed. Repair any tears in the weed block fabric. To control existing weeds, the following methods may be used: 1) hand pulling or 2) using a postemergence herbicide. These measures do not prevent reseeding of weeds. Few herbicides are labeled for use in a greenhouse due to the potential for severe crop injury or death to desirable plants. This injury may occur in a number of ways including: 1) spray drift occurs if fans are operating at the time of application, and 2) volatilization (changing from a liquid to a gas). Herbicide vapors are then easily trapped within an enclosed greenhouse and injure desirable plant foliage. Always be sure the herbicide selected is labeled for use in the greenhouse. Carefully follow all label instructions and precautions. It is the applicator’s responsibility to read and follow all label directions. Use a dedicated sprayer that is clearly labeled for herbicide use only. Some of the symptoms of herbicide injury include discolored, thickened, or stunted leaves. Sometimes, the growing point of young seedlings is injured, severely stunting their growth. Symptoms may be similar to those caused by nutritional imbalances, viral diseases or air pollution injury. Proper diagnosis is needed to determine the causal agent. In many cases, symptoms are so severe, that the injured plants cannot be sold. Herbicides are generally classified according to their mechanism of action (contact or systemic) and how they are used (preemergence and postemergence) Avoid use of preemergence herbicides in the greenhouse; preemergence herbicides are applied before weeds emerge. They provide residual control of weed seedlings and can persist for many months, and in some cases, over a year. Preemergence herbicides can continue to vaporize, causing crop damage. Currently, there are no preemergence herbicides labeled for greenhouse use. Postemergence herbicides are applied after the weeds have emerged. 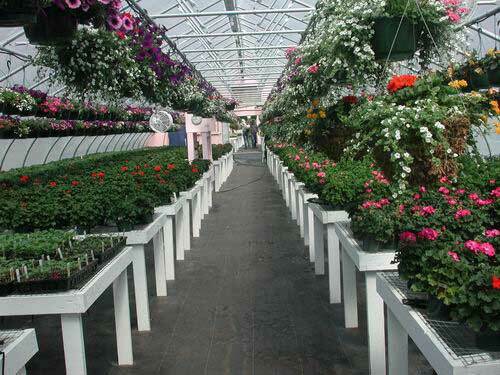 In the greenhouse, several postemergence herbicides can be used under greenhouse benches and on the floors. See New England Recommendation Guide for details. There are of two different types of postemergence herbicides: contact and systemic. Contact herbicides kill only the portion of the plant that the herbicide contacts, so good spray coverage is generally needed. Systemic herbicides are absorbed and move through the plant. The target weeds must be actively growing for the herbicide to be effective. Systemic herbicides are best applied to actively growing weeds when temperatures are above 50° F.
Systemics should not come in contact with desirable crop foliage. Irrigating crops too soon after applying an herbicide can wash it off the target weeds under the benches and reduce its effectiveness. Algae are primitive plants lacking true roots, leaves and stems that contain chlorophyll. The greenhouse provides an ideal environment for the growth of algae. Algae growth on walkways, under benches, and in pots or plugs is a problem for many growers. Algae compete with desirable plants for nutrients and form an impermeable layer on the media surface that can interfere with water penetration. During plug production, slower-growing plants can be especially sensitive to algae buildup. Algae are a food source for both shore flies and fungus gnats. Excessive growth on walkways can be a safety hazard to workers. Growth of algae on greenhouse coverings can also reduce light levels in the greenhouse. Prevention measures include sanitation, environmental modification, and frequent use of disinfectants. All surfaces should be kept free of plant debris and weeds that can be a nutrient source for the growth of algae. A physical weed mat barrier helps to prevent both weed and algae growth. Proper ventilation reduces the amount of moisture in the greenhouse. Horizontal airflow fans help regulate greenhouse temperatures and reduce excess condensation. Retractable roof or open roof greenhouses provide superior ventilation benefits. Overwatering crops frequently leads to algae and liverwort buildup on the surface of the growing media. Avoid overwatering crops, especially early in the crop cycle, to allow the upper surface of media to dry out between waterings. Select a growing media with the proper drainage for your crops. Water the growing containers only as needed, to prevent excess puddling on the floor. Avoid excessive fertilization, runoff and puddling on floors, benches, and greenhouse surfaces to discourage algae growth. The use of porous concrete floors limits the development of excessive moisture in the greenhouse. The greenhouse floor should be level and drain properly to prevent pooling of water. A number of disinfectants and algidices are registered for algae control in greenhouses. Disinfectants should be used on a routine basis as part of a precrop clean-up program and during the cropping cycle. Liverworts (Marchantia polymorpha) are branching, ribbon-like plants lacking distinct roots, stems and leaves. The reproduce vegetatively and by spores. Stalked, umbrella-like structures release spores. Small, bud-like branches produced in cup-like structures on the surface of the plant also help spread liverworts from pot to pot by water droplets during irrigation. Liverworts thrive in conditions of high fertility, moisture and humidity. liverworts and isolate infested plants. 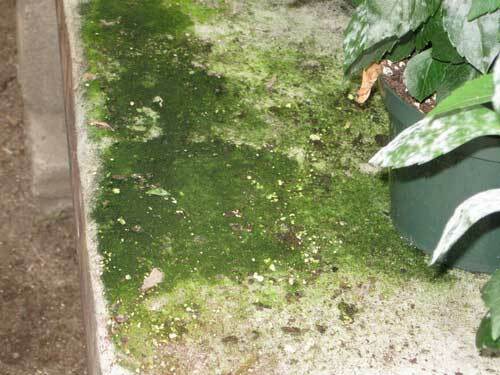 If the growing media stays moist, small infestations of liverwort can quickly spread through an entire greenhouse. Empty greenhouses should be cleaned and disinfested to remove spores. Growing media should be stored properly to prevent contamination by spores. Avoid overwatering crops and water according to plant need. Use course textured mulch to reduce surface moisture levels. Topdressing with a slow release fertilizer contributes to increased fertility levels on the media surface and to the growth of liverworts. Proper plant spacing helps to reduce humidity levels. Liverworts lack true roots, so allowing the media to dry between watering helps reduce their vigor. Managing weeds outside the greenhouse is important to: 1) prevent weed seeds from being blown into the greenhouse; 2) prevent perennial weeds such as bindweed, quackgrass, etc., from growing under the foundation of the greenhouse; and 3) help reduce the unwanted entry of winged insects into the greenhouse. Maintain a 10 to 20-foot weed free barrier around the greenhouse. A geotextile fabric can be used outside the greenhouse to prevent weed growth. Mow beyond this area to help limit the blow in of weed seeds. Or maintain a boundary of grasses, such as a mix of chewings, hard and creeping fescues. Thrips tend to not reproduce well on these grasses. Fescues are also not yet known to be hosts of tospovirsues. Herbicides may also be used outside the greenhouse. The label should state if use near greenhouses is permitted. Close the greenhouse vents and openings during herbicide applications to prevent drift inside to sensitive crops. Soil residual and post emergence herbicides may be carefully used surrounding the greenhouse. Herbicides should be chosen with low volatility that will control target weeds. Do not use any auxin type herbicides such as those labeled for broadleaf weed control in turf, near greenhouses. Their volatility and the extreme sensitivity of greenhouse crops to these herbicides can result in severe injury. Flame weeding is thermal weed control that uses propane gas burners to produce a carefully controlled and directed flame that briefly passes over weeds, searing the leaves and causing the weed to wilt and die. Killing weeds can be achieved by heating without actually burning the weeds. Weeds are most susceptible to flaming when they are seedlings, 1 or 2 inches tall. Broadleaf weeds are more susceptible to lethal flaming than grasses. Extreme care must be taken when using a flame weeder in or around a greenhouse. The most obvious concern is the chance of catching something on fire. Another, less obvious concern is the possibility that the heat may cause pollutants in the soil to volatilize.